Oh, butternut squash – how I love you. As a kid I never was served butternut squash. While I became more adventurous the older I got, something about squash didn’t appeal to me (probably the texture – I hate mushy food). After hearing my dietetic friends rave about butternut squash this and butternut squash that, I figured I had to break down and give it a chance. How had I been missing out on this heavenly food for so long?!? I was in love instantly. Then I added sage to it and I was in heaven. Ever since I have been making squash dishes a regular occurrence in our house. Since I don’t like mushy foods, I usually use the squash as a sauce or a component of the meal, but don’t often eat it plain. Since I’ve fallen in love with squash, our garden is always full of winter squash and sage plants. This dish is a simple way to throw together a delicious casserole. 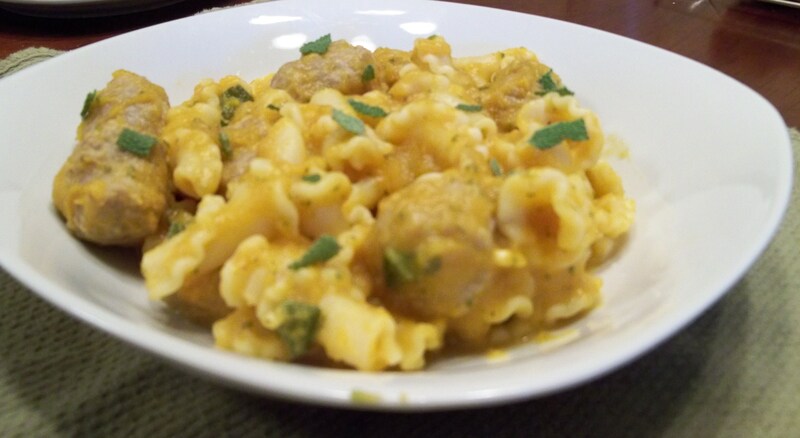 Using squash as the sauce cuts out the sodium and sugar often added to other pasta sauces. You don’t need to bake it in the oven unless you choose to put the cheese on to (and who doesn’t love cheese, right?). Preheat oven to 350F. Spray a 9×13 pan with cooking spray and set aside. Saute the onion in olive oil. Add the vinegar and mix well. Continue to cook down to desired consistency. Set aside. In a food processor, place all of the squash. Pulse/process until desired consistency. Add milk to think the mixture if needed. Add the sage and pulse to mix well. Add salt and pepper to taste. Add the spinach and pulse until combined. Add the onions and pulse until combined. Pour the sauce mixture over the pasta and mix well. Transfer to a the prepared dish. Top the dish with seeds and then shredded cheese. Bake at 350F for 25 minutes, or until the cheese is melted. *Tip – preparing winter squash can be a pain. To save time, I dedicate 1 weekend day in the fall to prepare cups of squash. After they are cooked, I portion them into quart freezer bags, so they are ready to go when I need them. I usually portion 1/2 of the squash cubed and 1/2 of the squash already pureed or mashed up. I have yet another egg bake to post about. This time it’s green, like everything else I’ve posted lately. Remember, green is good – in this case (and most of my recent posts) things are green because they are loaded with basil, which is hands-down my favorite herb. Between the CSA and my two basil plants in the garden, we have been (and will continue to be) eating lots of deliciously seasoned dishes. Summer squash and zucchini have made it into our CSA box already. Where did the summer go?? Anyway, this is just the beginning of the squash surplus, so I’ve decided to start early with compiling recipes. 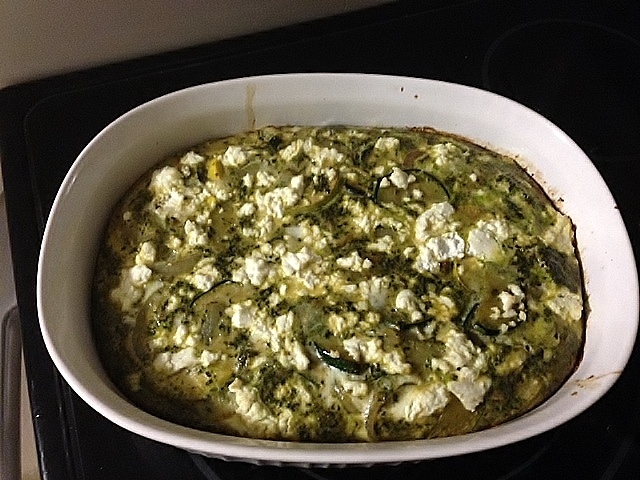 This was the first dish of the year – green eggs and goat cheese. I prefer summer squash sautéed; something with the membranous texture of raw squash doesn’t sit well with me. I had never had eggs with squash before, but it makes for a very filling and satisfying breakfast. What do you like to do with your summer squash? Preheat over to 350F. Spray a large baking dish with non-stick cooking spray. Heat about 1 tbsp of oil in a pan. Add onion and saute for 5 minutes. Add the basil and mix well. 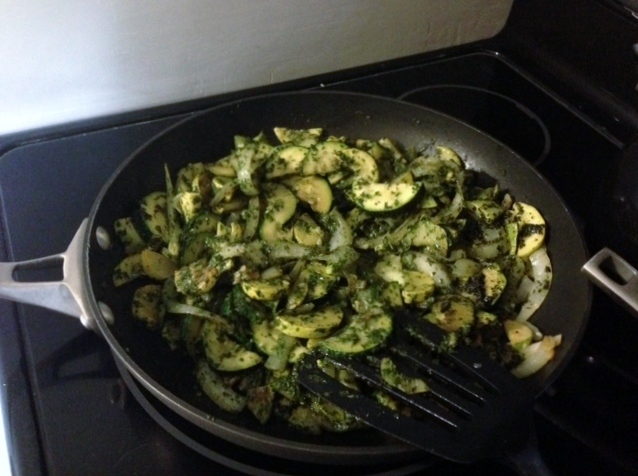 Add the squash/zucchini and continue to saute until the squash begins to appear slightly translucent and soft. Turn off the heat and add the balsamic vinegar. I probably added 1/4 cup, but I love balsamic – add as much as you like. Pour mixture into the prepared pan. Top with crumbled goat cheese, salt, and pepper. Cook for 40 minutes, or until the edges begin to pull away and there is no standing liquid in the center of the egg bake. Since you added some oil to cook the vegetables, there may be some oil standing when it’s done (which is why I use the edges pulling away as a guide). Butternut squash. 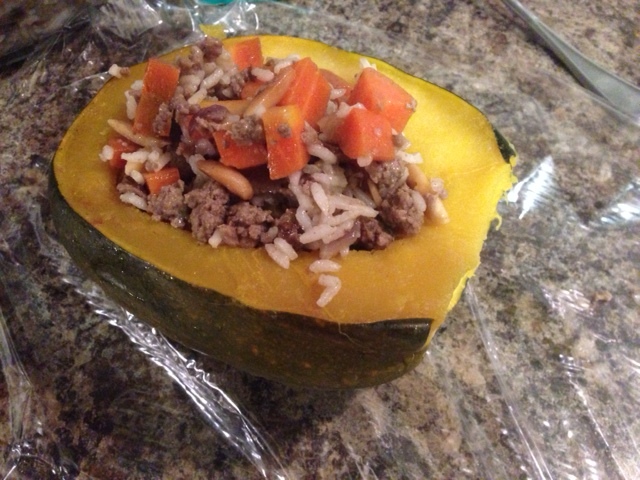 I am one of the few and far between in the nutrition field who have never eaten butternut squash before. When I was a kid my parents never prepared dishes with winter squash and I can count the number of times I have prepared it in my lifetime on one hand. Something about the dense shell and overall size of the squash tends to be a little daunting to a novice. That challenge was what I needed to feel excited about cooking again. This dish is the most delicious dish I have ever, I repeat, ever made. The subtle sweetness of the squash paired with the spice of the spinach and topped with a light cream sauce makes every bite unexplainably delicious. I guarantee this dish is worth the somewhat lengthy prep time. It’s that time of year when chili, soup, pumpkin, apples, cranberries, and chocolate are in season. 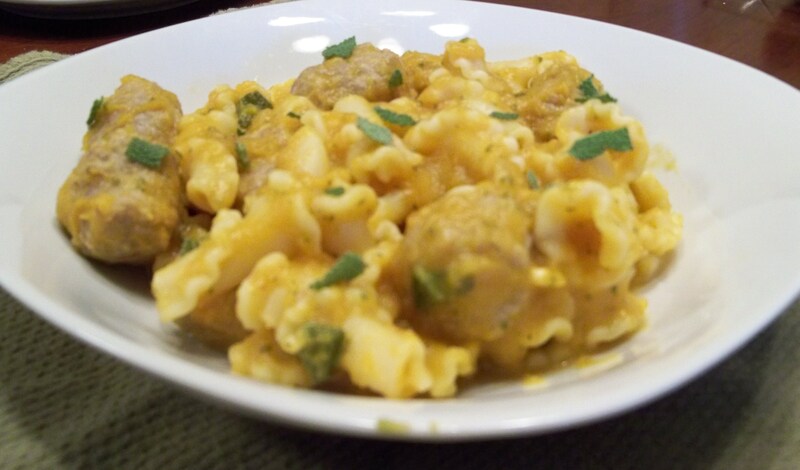 I have wanted to try pumpkin pasta recipes for the past few years but have been a little scared to. In my mind, pumpkin is a dessert food and I couldn’t fathom how it would taste. After seeing many recipes with 5-star reviews that sounded delicious, I decided it was time to step outside my comfort zone. I stumbled across GreenLiteBite’s Pasta with Pumpkin, Sausage, and Spinach recipe that sounded simple enough and decided to give it a try. I was also making soup and muffins at the same time, while trying to keep an eye on two cats who having been taunting each other all day, so I accidentally forgot to add the spinach…whoops! The dish is delicious and I only made one minor change to the recipe to make the sauce creamier. Enjoy! Cut the sausage into 1″ discs. The original author recommends freezing these a bit to make the easier to cut. Mine were fresh and were a little messy to cut but still worked. Heat a large skillet over medium-high heat. Brown the sausage with the onion and garlic in 1 tsp olive oil. Once brown, drain off the liquid fat – there will be quite a bit so I strongly recommend doing this (if your turkey sausages don’t have much fat this might not be necessary. *If you would like to add spinach, I would recommend adding it now. Cook until just wilted. Place sausage mixture in a very large dish. Add pasta to dish once finished. Return the pan to the stove and add the chicken broth. Bring to a boil. Lower to medium heat and add the pumpkin, yogurt, sage, nutmeg, salt and pepper. Stir to combine everything. Keep on medium until the sauce begins to boil again then lower to a simmer. Place hot mixture in a food processor and puree until smooth. Food processors can only handle so much liquid at once, so I did the sauce in three parts. After each part is finished, pour over pasta and sausage. The original author suggests serving with a sprinkle of parmesan!